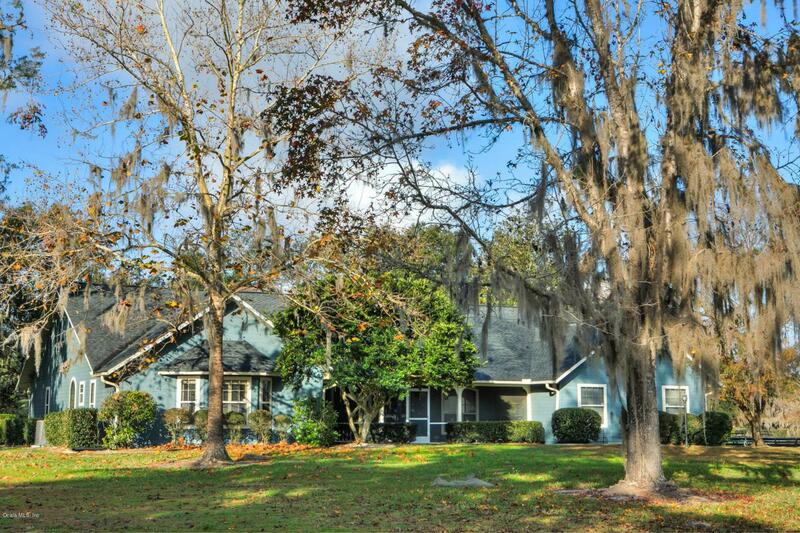 This stunning farm is located in Central NW Ocala's prestigious horse country, in an equine-minded community where riding on and off your farm is a pleasure. This 8+ acre farm is the perfect size for manageability, and features a professionally installed and well maintained arena with GGT footing and irrigation system. There is a 6 stall center-aisle barn which includes feed and tack rooms, fly spray system, equipment storage, and wash rack. The 7 paddocks are beautifully fenced with board and no-climb fencing, for the safety of all your four-legged friends. This farm includes an adorable 2 BR guest apartment above a 3 bay garage. The bright and beautiful home includes a split plan for lots of privacy, spacious eat-in kitchen, fireplace, and tons of windows. The screened andsolar heated pool is just the place to cool off and relax, or entertain friends. You will enjoy the best of the Florida lifestyle at this turn-key farm.